Meet Miss Ophelia Bluefeather and Mister Cecil Ravensfield, the latest in my characters-from-doodles series. 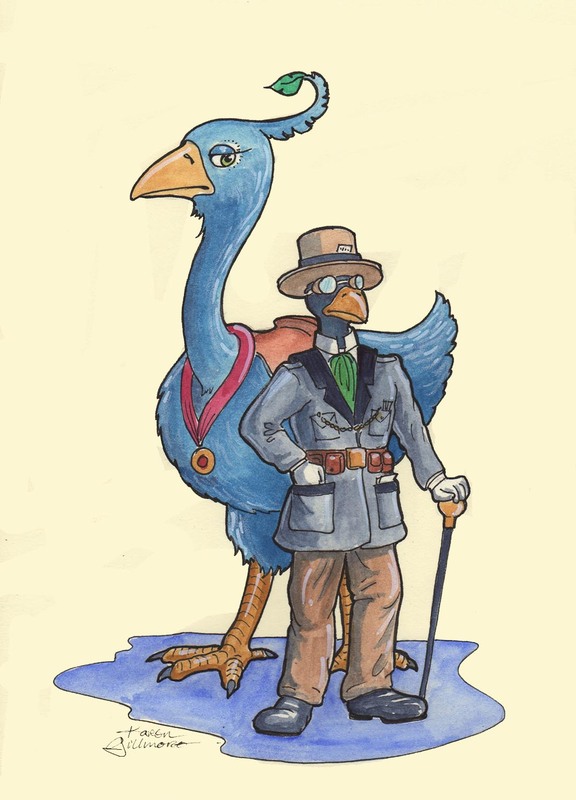 They are a famous pair of scientist-adventurers, known for their daring exploits on the frontiers of archaeology and natural history. They are also working on a time-travel device. ink, watercolour, and a bit of white marker and pencil. Like what you’re seeing here? I also send out once-monthly (used to be twice monthly, but now with occasional extra posts) e-mails that have even more of the kind of goodies I post on this blog — but with exclusives for subscribers: art tips, works in progress, breaking news about my projects, free digital stuff like colouring pages and downloadable art and comics. I also get let my hair down a little; it’s a bit more personal in tone, like you’re my pen pal (replies encouraged!). This is a separate list from the e-mail subscriptions to this blog. I use MailChimp, an e-mail list platform that never gives away or sells your information, and you can unsubscribe anytime you want. Why not give it a try? Oh, I love Miss Ophelia Bluefeather! She looks like she’s having an eye on her partner, being more life-experienced than him. He’s a bit out of worldish, methinks…. Well spotted! She’s actually the brains of the outfit, as well as the transportation, but he has his uses, such as the opposable thumbs. He also is the keeper of the timepiece. Sounds like an interesting story! I could imagine it would either be very difficult or quite easy if you’re just going back / forward to a specific time. It’s when you go all ‘Dr. Who’ that you’d have to watch out for all those paradoxes! The paradoxes are the fun part — they’re what make a time travel story , for me! But yes, way harder to write. 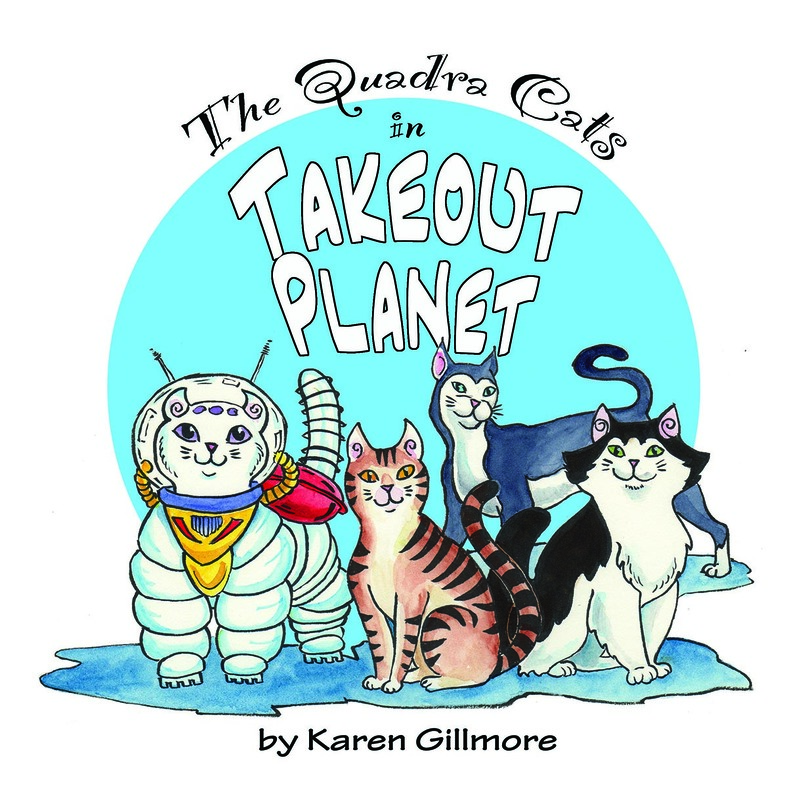 When the neighbourhood cats meet a takeout-obsessed Alien Cat, they become impromptu ambassadors for Earth! Updates Mondays and Thursdays. 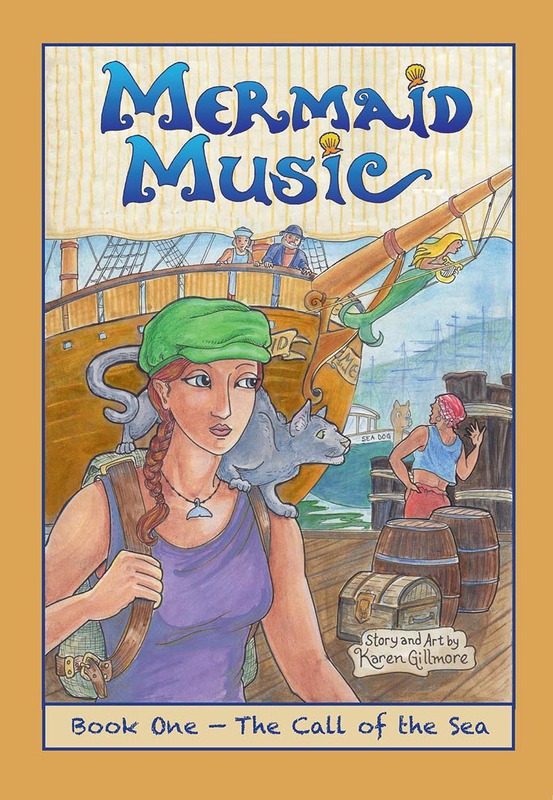 Mermaid music is the story of a girl who accidentally runs away to sea, and finds herself in deep water indeed! Click the image to read the webcomic from the beginning. ...except as otherwise noted. If you share, please link back to this blog — you'll feel a warm glow right in your karma! “Two Lips” — from a photo I snapped of a bunch of tulips someone had given me. As the petals started to fall away, they got more and more interesting. This one took quite a long time, lots of burnishing. “White Rose” — I took a bunch of white silk roses into a class I was teaching one day, and we all had a good time trying to make them look natural, adding backgrounds and suggestions of colour. “Sheltered” — a demonstration on doing an underpainting in dark grey pencil to establish the values turned into this. “Broken Seashell” — I like to pick up broken seashells, because their curves are challenging and fun to draw. For this one, I used a technique I often use for figure drawing — woking on toned paper and just picking out the deepest shadow and the highlights with white and black pencils. “Falling Apples” — When I teach a coloured pencil workshop, I often go buy a bag of apples and hand one out to everyone. Apples are excellent subjects for learning how to build up colour from light to dark. After my demo, he whole class goes back to their tables and becomes very quiet for a while — silence is the sound of creativity! One class I actually had time to draw my apple several times on the same page. “El Morro” — the famous landmark fort at the mouth of Havana harbour. I got really caught up in the rocks on this one. “Pink Rose” — One of the most burnished coloured pencil paintings I have ever produced. This little thing is the size of a greeting card, and it took me many hours. “Bear Hangout” — from a photo I took in Seattle’s Woodland Park Zoo. There were no visible fences, and everyone wanted to know how I’d gotten so close to the bears! Usually I would just smile and look mysterious. Man Forming a Triangle — coloured pencils on toned paper. Going through my sketches, I was amused to see how many similar poses I’ve drawn over the years — there are only so many ways the human body can fold up, after all. I thought this drawing made an interesting comparison with the previous one. “Golden Retriever” — coloured pencil. I got the detail of the brush in the background by indenting the paper through a piece of tracing paper with a pencil. The tracing paper protected the working paper from the pencil, and I was able to lightly colour over the indented lines with my coloured pencils, building up layers of mixed colours. I eventually decided the white lines this left were too stark, and went in with very sharp pencils in different colours to tone them down. “Mount Baker Dreams” — The ferry from Sidney BC to Anacortes , Washington puts in at one of the islands in between. This is what I saw from the dock. “Sunshine” — funny how cats always find the warm spot in the house! “Bones of the Earth” — a mountain in the Montana Mission Range that has an oddly shaped top above the treeline. It is not a volcano, but I suspect there is a hollow at the top with a lake. However, I did not climb up there to see. Wickaninnish Wind — This tree stands by the parking lot at Wickaninnish Beach , in Pacific Rim National Park. “One Perfect Rose” — an anniversary card I made for my husband some years ago. “Willow Banks” — part of a large wetland park at the base of Montana’s Mission Mountains that I visited once. “Winter Tree” — a Christmas card I did for a friend; the white was all masked off with masking fluid, after which I could paint freely, knowing all that lovely snow would be preserved in pristine white paper. “Storm Building” — I used a paper towel to lift colour out of a solid sky wash for the clouds, then dripped in a bit of grey, then more water for the backwashes. pebble sampler — I make samplers of many of the techniques during class, using pebble shapes. “Haunted River” — painted over a saran-wrap texture in multiple glazes; an example of mixing paint on the paper. “Night Lights” — the background nebula-like blooms of sky colour are salt; the individual stars are dots of white ink. “Long Beach Sketch” — the backwashes created by dripping water into a wet wash created the clouds and the misty effects in the rocks on the right. “Edge of the Woods” — I started with very light washes to build up the background and lighter tones of the foreground; the dark trees went in last. The UFOs are coming! Or maybe they are flying hats. Suggested by one of the students, I thought it was a great idea. This demo used salt and gouache to make stars and the explosions (or maybe they are fireworks). The city is just simple brushstrokes with a flat brush. This demo was to blend a nice sunset wash, and to show how to make very quick trees with brush scribbles. This demo was to show lifting paint out of a blended wash (and add some more for shadows) to make clouds, and how to make aerial perspective by making distant things lighter and bluer. I wasn’t sure what the landscape was going to be, it sort of evolved as I went along. Demo to show masking (I masked off the blue areas), and how to draw people in about ten seconds! This is kind of a bizarre picture because the blue areas look like holes in the sky, but I kind of like that effect. “The Sky’s the Limit” — a tiny painting, 4×6 inches, in which I demonstrated lifting wet paint to reveal the light. Lots of folks liked these posts!